SELINSGROVE, Pa. – Selinsgrove Speedway will present the Fifth Annual Kramer Cup at 7 p.m. Saturday, June 2, to honor the memory of sprint car racing legend Kramer Williamson of Palmyra. The 30-lap 360 sprint car race will pay $2,573 to win and $300 to start. Joining the 360 sprint cars on Reinhart Food Services Night will be the limited late models, pro stocks, and roadrunners. The limited late models will also run the May 5 makeup feature. Newville Construction and the Newville Family of Businesses posted $300, $200, and $100 bonuses to the top three finishing 358 sprint cars in the 360 sprint car main event. Pit gates will open at 4 p.m. with grandstand gates at 5 p.m.
Kramer Williamson succumbed to injuries he sustained in a sprint car racing accident at the Lincoln Speedway in Abbottstown in August of 2013. For most of his racing career, Williamson drove the famous “Pink Panther” No. 73 sprint car and won hundreds of races across the country as well as in Australia and Canada. 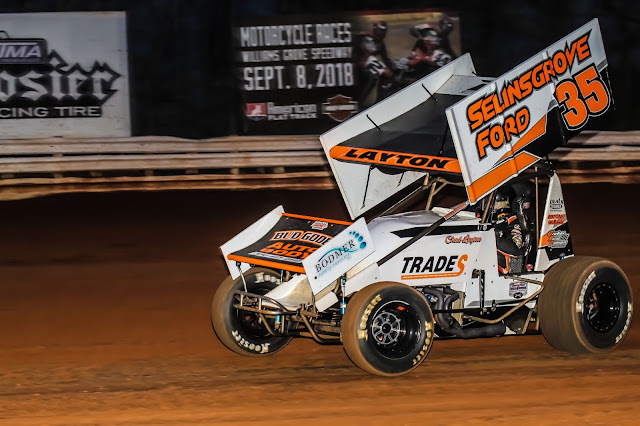 He clinched sprint car track championships at Selinsgrove Speedway and Williams Grove Speedway, where he also was a former winner of the prestigious Williams Grove National Open. In 2008, Williamson was recognized for his incredible accomplishments in auto racing when he was inducted into the National Sprint Car Hall of Fame in Knoxville, Iowa. At Selinsgrove Speedway, Williamson’s lone championship was in 1978. His first win in a super sprint car at the track was on Sept. 3, 1973, and his last was on Aug. 10, 1981. He is tied with Barry Camp of Beavertown for the ninth spot on the track’s all-time win list for super sprint cars with 25 career victories. During the latter part of his career, Williamson had been touring on the URC circuit. He scored a single URC win at Selinsgrove on July 8, 1995, which was the last time he won a race at his former home track. In all, Williamson recorded 67 career wins and three championships with URC. The qualifying format for the Kramer Cup will include heat races (draw for starting positions) and a B-main. The winner of the 30-lap feature will receive a custom pink trophy cup to commemorate the victory. Mark Smith of Sunbury won the inaugural Kramer Cup in 2014 and took victories again in 2016 and 2017. Robbie Stillwaggon of Burlington, N.J., scored the prestigious win in 2015. Members of the Williamson family are expected to be in attendance with one of the Pink Panther No. 73 sprint cars on display at the track. Race fans and teams are invited to wear pink apparel to honor the memory of Williamson. Selinsgrove Raceway Park will run a complete program of go kart racing at 7 p.m. Friday, June 1. Track gates will open at 5:30 p.m.